Amid the startling statistics and images that have become the hallmark of the eco-doc, “Wasted! The Story of Food Waste” offers elegant, constructive solutions to the worldwide issue. A free screening of this 2017 documentary, produced by Anthony Bourdain, attracted 250 viewers to White Hall on Jan. 24. The screening was preceded by a restaurant showcase and followed by a panel discussion. The film was informative and entertaining, featuring some larger-than-life personalities recognizable to a frequent viewer of Netflix’s “Chef’s Table.” It provided solutions on individual, local and global levels, and delivered engaging graphics to contrast the intermittently dark discussion of the effects of food waste on our climate. Bourdain, who narrated the film, appears on screen as the first and last images. “I don’t even know if we deserve to live,” he expresses within the first minute. His fatalistic approach to the issue presents a challenge: Do we give up on humanity or take tangible action? The affirmative sounds of “mm-hm” and “uh-huh” from community members indicated that they were up for the challenge. While the film scrutinized the outrageous scale of food waste in the United States, renowned chefs, growers and consumers alike offered solutions from an international perspective. Tax and economic incentives are among the most commonly implemented and effective modern methods of eliminating landfill waste, from South Korea’s food scrap pay-by-weight system to France’s grocery store waste fines. The film explained how some environmental, economic and social concerns could be alleviated through education and action on food waste, by teaching kids to grow and compost their own foods and by demanding better landfill diversion from grocery stores and restaurants. Ultimately, the film proposed capitalist solutions to incentivize or deter rather than attempting to dismantle a whole economy of waste. Select restaurants leading the Atlanta sustainable food movement were invited to showcase tastings of their signature dishes before the film. Miller Union, Double Zero, Montane Sparkling Spring Water and Wrecking Bar Brewpub provided tastes of some of their signature dishes before the film. The portion sizes were small, which felt appropriate considering the event’s focus. Some highlights included a grain salad — bright from its acidity — and fresh vegetables (which included the stems of the greens). Montane Sparkling Spring Water showcased their delightful lemon honeysuckle flavor, among others, which were decidedly more flavorful than your average LaCroix. Miller Union served one-bite portions of raw swordfish with blood orange, microgreens and herb crema. The pre-film tasting provided an opportunity to mingle with other attendees, which mainly included Emory graduate students, Emory employees and members of Slow Food Atlanta. What connected attendees the most was a shared interest in the film’s subject of decreasing food waste. Rather than feeling drained by difficult subject matter or unfamiliarity, the like-minded viewers engaged in lively, passionate conversations. During and after the film, viewers vocally objected to portions of the film and its framing. “The concept of needy people wasn’t fleshed out,” said Armaan Malde, a Georgia Institute of Technology student. The panel discussion after the screening brought together five Atlanta-based waste diversion advocates: Steven Satterfield, executive chef and co-owner of Miller Union; Robert del Bueno, managing partner of Southern Green Industries; Jasmine Crowe, founder of Goodr, Inc.; David Paull, co-founder of CompostNow; and Michelle Wiseman, director of waste diversion and outreach for Atlanta’s Office of Resilience. 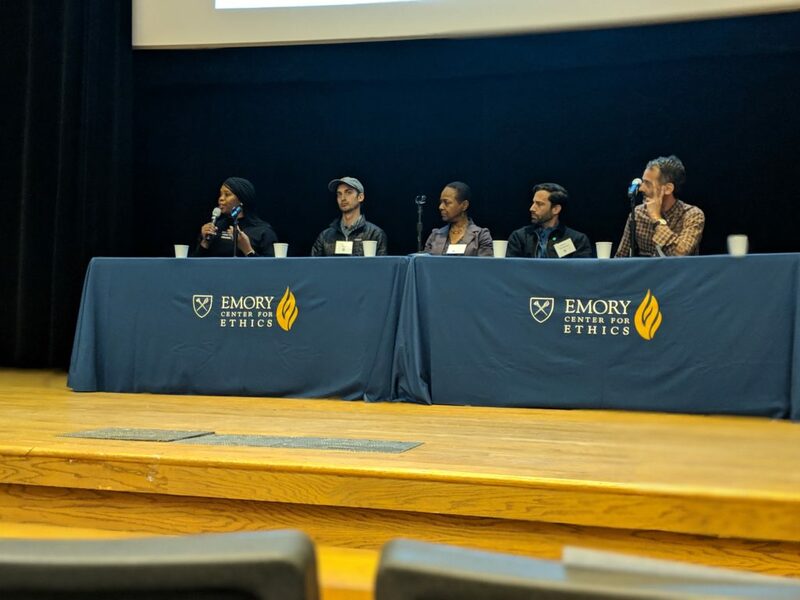 Jonathan Crane, the Raymond F. Schinazi scholar in bioethics and Jewish thought at the Emory Center for Ethics, moderated the discussion. The panelists commented on decreasing food waste and diverting that waste from landfills. Crowe discussed her app, Goodr, which works directly with businesses to identify how to donate their food to those who need it most. Goodr recently signed a contract with the Super Bowl to divert the organization’s food waste. Paull asked the audience for a show of hands of who composts. More than half of the attendees raised their hands. This crowd was already taking action to curb food waste on an individual level, and the conversation shifted to action on the level of community infrastructure. Wiseman, when prompted, said there is nothing in the works for a public compost service in Atlanta, but that she supports the work of CompostNow. While informative, the panel lacked the voices of growers, farmers or gardeners, leaving an important perspective unrepresented. This event served to motivate a group of sustainably minded Atlanta citizens to action. Bright flavors and graphics broke the monotony of a Thursday evening, and guests left White Hall 208 with tangible solutions to food waste, which masked, even for a night, pessimism that is often rooted in conversations about climate change.